Sometimes in the evening when I am too tired to do anything productive yet too awake to actually sleep I’ll lay out on the couch, covered in some cats and a pile of blankets, and look through back issues of Everyday Food. Anthony and Isobel are typically playing video games and I might have a pad of paper and a pencil, but more likely I’ll be recording my meal planning inspirations on my phone. If I’m not writing things down I usually just take a snapshot of the page with my phone – lazy meal planning at its peak. 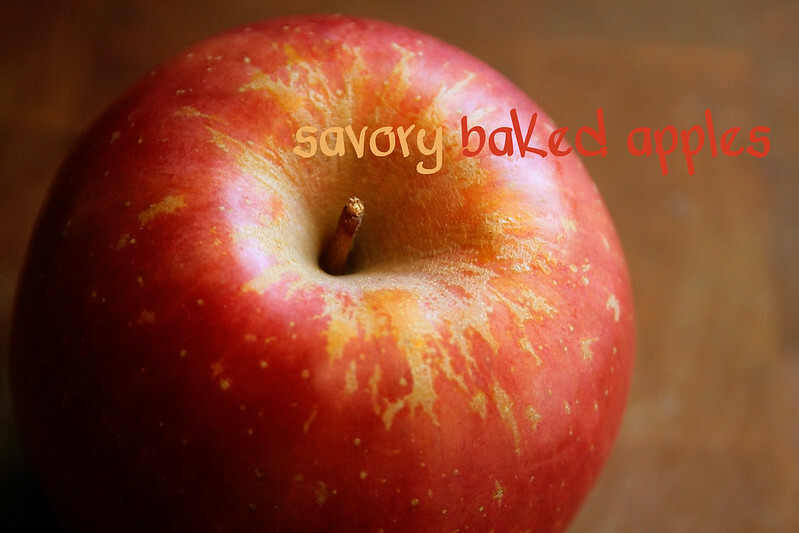 In one autumn issue or another, the editors at Everyday Food posted a sweet baked apple recipe and then, as an aside mentioned some savory toppings to add, too. 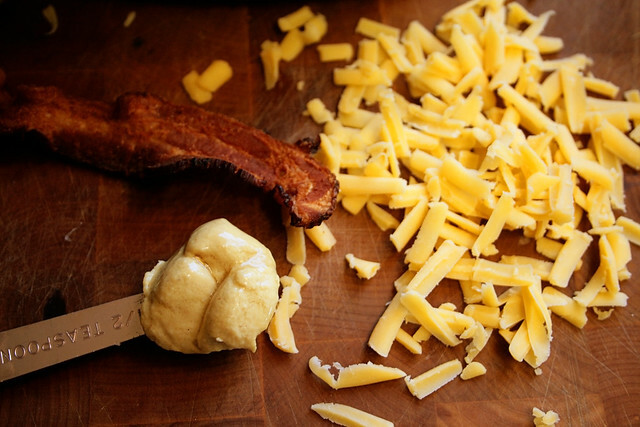 One included ham, mustard, and cheddar cheese. It sounded so intriguing I couldn’t wait to try it. My version deviates slightly from the original. The magazine said to add a full teaspoon of Dijon mustard to each apple half. That seemed ridiculous, even for the large Fuji apples I was using, so I cut it down to a heaping half teaspoon. That was still a bit much, so I scaled it back to a level half teaspoon or less. I’m not a fan of ham in the best of times, and just the smell of deli meat makes me nauseated while pregnant. 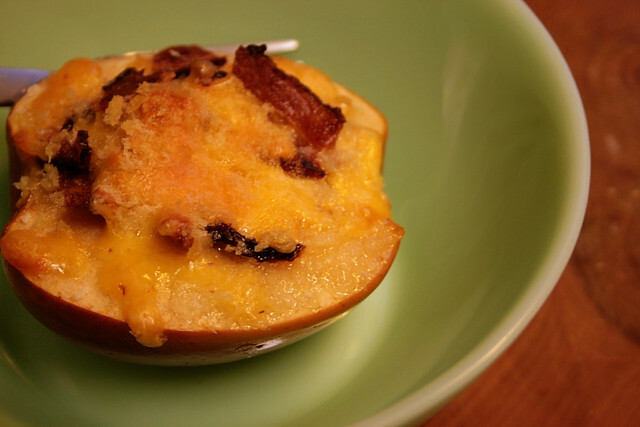 We had some leftover cooked bacon from a baked potato night so I crumbled up a couple slices and added that instead. I don’t have any sort of device made for coring apples, but my frequent thrifting trips has yielded several melon ballers which are perfect for the job. They are the perfect shape for scooping out the undesirable centers with precision while keeping the flesh of the apple intact. A spoon will work just fine, too, though don’t worry if it doesn’t look as nice. 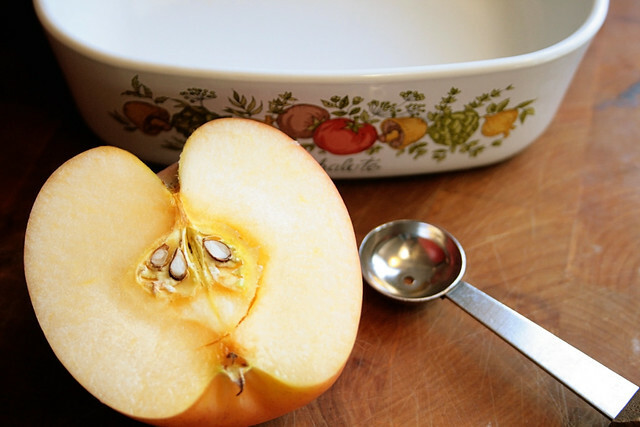 You will be filling the apple with savory goodness anyway. As a rule I use panko whenever bread crumbs are called for, but if you happen to have a rustic loaf lying around its hearty crumbs would be particularly fabulous. I loved how this turned out, though Anthony agreed the amount of mustard was unbalanced. You could easily pair this with some sausages and sauteed spinach for a hearty fall dinner in less time than it takes to make a baked potato. It tasted a lot like a grilled cheese sandwich but with hardly any carbs or gluten to speak of. 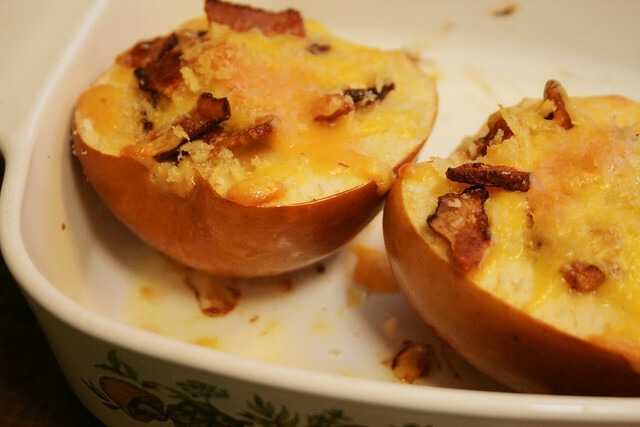 I almost sang its praises as a vegetarian side dish before realizing it’s covered in bacon. Oops. 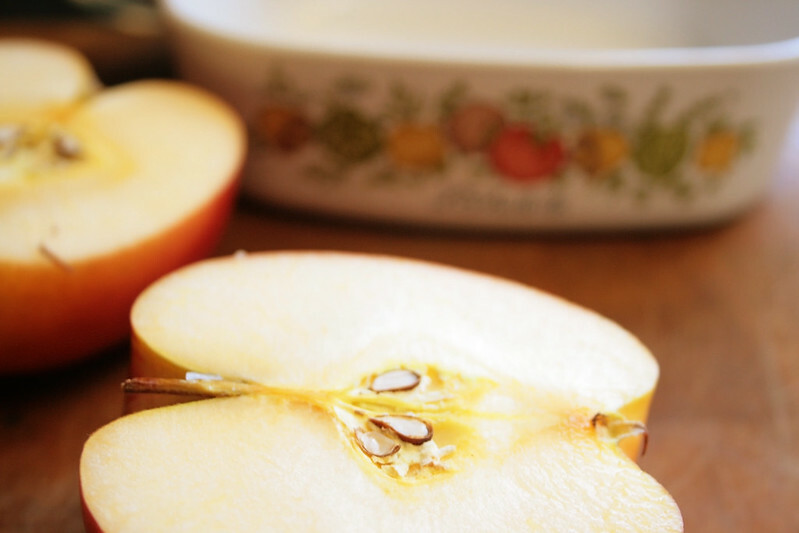 – Slice apples in half lengthwise and core. 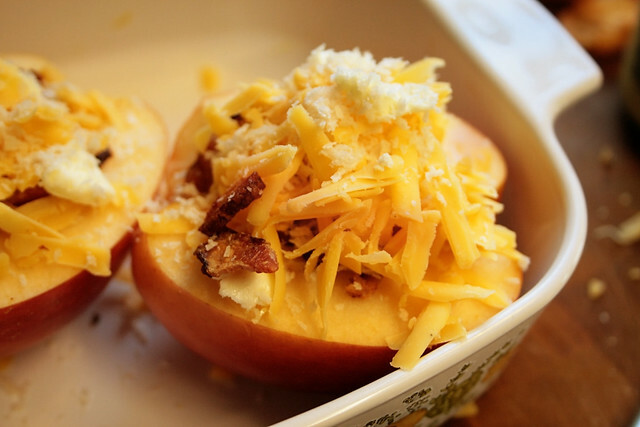 – Fill cavity and top of apple with a layer of mustard, cheese, bacon, and another small sprinkling of cheese. 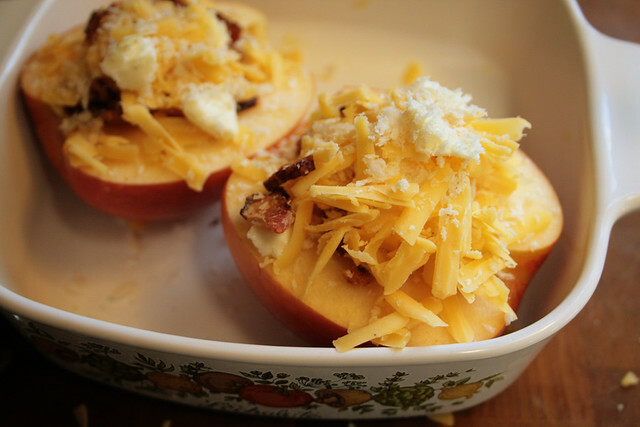 – Cover apples with panko or bread crumbs and dot with butter. – Bake for a half an hour, checking at the 20 and 25 minute mark. If apples start to brown excessively, tent with foil. – Enjoy hot or warm. This couldn’t have come at a better time…I just bought about 800lbs of apples on sale the other day. It’s fate. 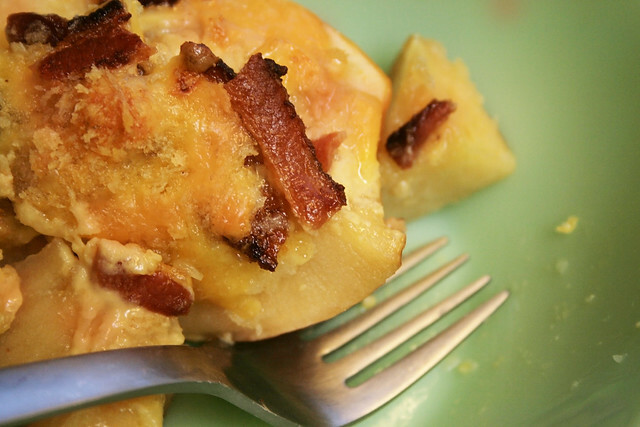 Ton of apples in the crisper + frustrating day in need of comfort food = giving this a whirl. The family enjoyed them all. Already planning the next batch. I am so glad you and your family loved it, Elaine!